It’s almost half term already … how did that happen?! There’s plenty of half term events in Llanelli and further afield in Carmarthenshire and Swansea to keep you busy through the week – even if it rains (as it probably will). Take your pick from film shows, bird watching and even keeping the beach at Pembrey clean! Daily. Activities are free after entry. Dusty Duck’s puddle jumping competition will take place at 2.30pm every day during the holidays – see who can make the biggest splash! Other activities through the week include den building (all day), wildfowl wonders workshops (11am-12 noon), family bird watching (1pm-1.45pm), and craft workshops (times vary, there may be an additional charge for materials). February 17-25. Free, but normal entry charge applies. Help keep the birds in your garden full until spring by making bird feeders – from 11am to 12.30pm, then go on a bird spotting adventure around the grounds with a guide to see what breeds you can find from 2pm-3pm. Be amazed by ultra violet illusions and magic tricks by Jugglestruck. 11am, 1pm and 3pm Monday to Friday (no 1pm train on Thursday). Adults £12, children up to 15 free, dogs £2. Ride the steam train up the Gwili Valley on an eight-mile round trip. There’s a stop at Llwyfan Cerrig station, where you can enjoy the miniature railway. Fluellen Theatre Company presents its pirate show written exclusively for Folly Farm. A Folly Farmer runs away to join Black Bart’s crew and learns how to be a pirate in this pantomime style show. 4pm, Sunday, February 18. £11 for a kids club pallet (fits two adults and one child or one adult and two to three children). A screening of the film, with healthy pallet picnics available to buy from the cafe. 9.30am. £4 for adult and child. A happy environment for parents and their children to move and dance together. Monday, February 19 and Tuesday, February 20, 10.30am-12.30pm. Free (parking fee applies). Children aged between 7 and 12 are invited to join in woodland adventure sessions with park rangers. Learn about the woods, help make a camp fire build a den, and find out what lives among the trees and pond. Spaces are limited, and can be booked by calling 01554 742368. Don’t forget your coat and wellies! Monday, February 19, 2pm. Free. Join Wales Wildlife Watch litter pickers to keep our countryside clean. Meet at car park no 2. Monday, February 19, 2,30pm. £2.50. An afternoon screening of the classic film. 7pm. Adult £14.50 Danger Zone £17, Child £11.50 Danger Zone £13. Back by popular demand, the “troublesome twosome” plan to amaze and delight you with their Magical Mischief Tour – a brand new exciting production for 2018 – a completely unique, fast paced, cirque style variety and comedy show, interspersed with magic, illusions, International circus acts and stunning professional dancers. Tuesday, February 20, 2,30pm. £2.50. Another 80s film screening, this time The Goonies. Wednesday, February 21, 2,30pm. Adults £8, children £12. Time-travelling magicians Morgan & West return to the stage with a marvellous magic show full of crazy capers for the young, old and everyone in-between. Learn all the skills you’d ever need to run away with the circus! Families are invited to a free dinosaur themed event, with comedy cavemen and appearances from three baby dinosaurs. The Pre Hee Men will be there in their specially themed car complete with stone age music and sound effects, ready to cause some cavemen chaos. Children will love Rex the baby T Rex. Standing at 8ft tall and 17 foot long, the lifelike animatronic dinosaur is thrilling to see. The Jurassic rangers will also have some newly hatched dinosaur babies with them. The giant t-rex will be performing three 30 minute slots; while the baby dinosaurs will make two 20 minute appearances. There is even a giant dinosaur egg that children can pose for a photo inside. Thursday, February 22, 2,30pm. £2.50. Another 80s film screening, this time Ghostbusters. Thursday, February 22, 7pm. Family £35, adult £12, concession £9. Experience the excitement and atmosphere first hand as top names in British wrestling battle it out in an evening of high impact wrestling action, suitable for all the family. A high-energy show packed with all of Little Mix’s greatest hits, including DNA, Wings, Salute, Black Magic and Love Me Like You. Work off some energy before the end of the holidays with an active play session at the library. Friday, February 23, 2,30pm. £2.50. The National Botanic Garden of Wales is hosting a Star Party, in partnership with Swansea Astronomical Society and AstroCymru. Stargazing through telescopes plus talks and telescope advice clinics in the Great Glasshouse; with food and drink available from the Med Cafe. There will also be a 3D Cinema and astronomy artefacts, where visitors can handle objects dating from the birth of our solar system. Castor, Pollux, Sirius, Capella and Procyon should all be visible, and we will use Orion to star hop so they can find the Pleiades. While the stargazing is weather dependant activities will be run inside the Great Glass House if the weather is poor. For more information about this and other Garden events email info@gardenofwales.org.uk or call 01558 667149. 4pm, Sunday, February 25. £11 for a kids club pallet (fits two adults and one child or one adult and two to three children). 1pm (both days). Free after entry. 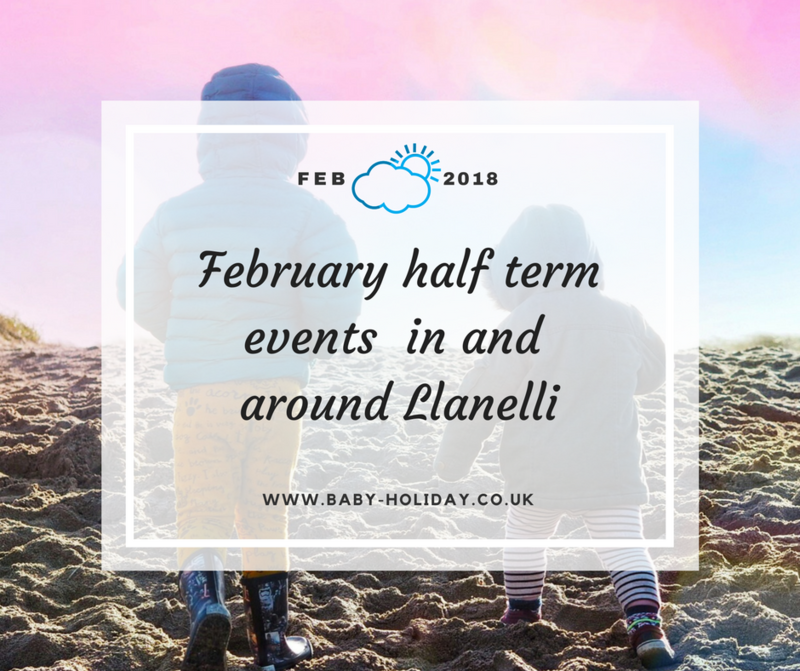 *If you know of any other half term events in Llanelli, let me know! Either add a comment below, or on my Facebook page. ← Turtle Bay Swansea for a child-free Sunday lunch!